Born February 3, 1968 in Downey, California Thomas Scott Medlin grew up somehow escaping the firstborn tradition of being named George. His great-grandfather George Medlin was a pioneer machinist in the state of California who along with Tom’s grandfather (you guessed it), George, started Medlin & Son Engineering in 1946. The tradition continued with Tom’s father, George (known as Bill) and has continued with Tom and his brother Greg to this day. I bet I know where at least one of Tom’s two daughters is going to work. As you can imagine, Tom and his siblings grew up at Medlin and Son. Each day as school was let out the shop served as temporary daycare until each of them was old enough to take up shop chores like sweeping which manifested itself into machining. If you grew up in a family business like I did, you know the drill. In the 40’s the shop started out as a machine and fabrication shop with old screw machines from the World War II era making spacers, bolts and fittings. Today the shop has expanded to fifty employees of which nine of them are family. Grandpa George still serves as the delivery driver. Growing up the Medlin boys were forbidden to have anything to do with motorcycles and always have been. So the love of motors came from childhood when Tom was given the privilege of attending Ontario Motor Speedway and Pomona as a spectator. When Tom turned fifteen he bought a 1968 Mustang for $125. “It was a backyard trashcan car,” as Tom called it. It had a block under the hood but the intake was missing and the heads were in the trunk. The Mustang became his Auto Shop project in high school. After the project was completed he sold the car and used the proceeds to buy a turn-key ’68 Camaro. While in high school Tom met the future Mrs. Tom Medlin (Sonja) and before long set her sister, Kim, up with another auto shop friend, Augustine Herrera. As the couples spent more time together the rebel motorcycle influence of Augustine, who grew up on motorcycles, rubbed off on Tom. At first Tom would sneak out to ride Augustine’s dirt bikes. When Augustine bought an ’87 Suzuki GSXR 750 Tom was of course given the opportunity to ride it. 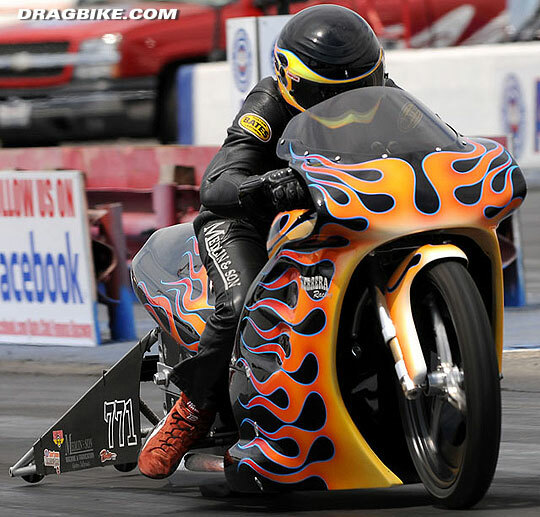 The first time Tom rode the bike it was also the first time he rode a streetbike of any kind and it was down the quarter mile at Carlsbad Raceway. This led to Tom buying his first motorcycle, an ’86 GSXR 1100. This motorcycle led to a great history of racing. I wonder if Mom and Dad know what Tom does on weekends? I’ll let you read Tom’s credentials below but to sum it up, Tom has been very successful in drag racing and is without question one of the heavy hitters of the West Coast. Even though Tom was thirty years old when Prostar started racing out West, he was still considered one of the young guns back then. Today, he and his band of buddies are veterans of the sport. 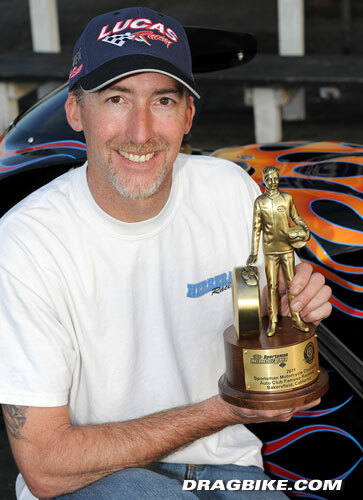 With eight championships to his credit he is again leading the way in 2011 in both the NHRA Division 7 points and the Summit Series at Fontana. Tom’s passion for cars has not ceased either. He is currently turning his dad’s original ’30 Ford Model A into a Rat Rod complete with a flathead. Some things never change. Current race bike / class: TSP small tire chassis w/ ‘93 Suzuki GSXR Body & GSXR oil cooled motor– PRO ET. Interest outside of racing: WakeBoarding , SnowBoarding, Riding in the sand dunes, and just working around the garage. Classic car: 1930 Ford Model A. First motorcycle: 1986 Suzuki GSXR 1100 put together from boxes of parts.